Bright yellow, small, vocal. Common across North America in summer; winters in Central and South America. Prefers shrubby, woody areas, especially near water. 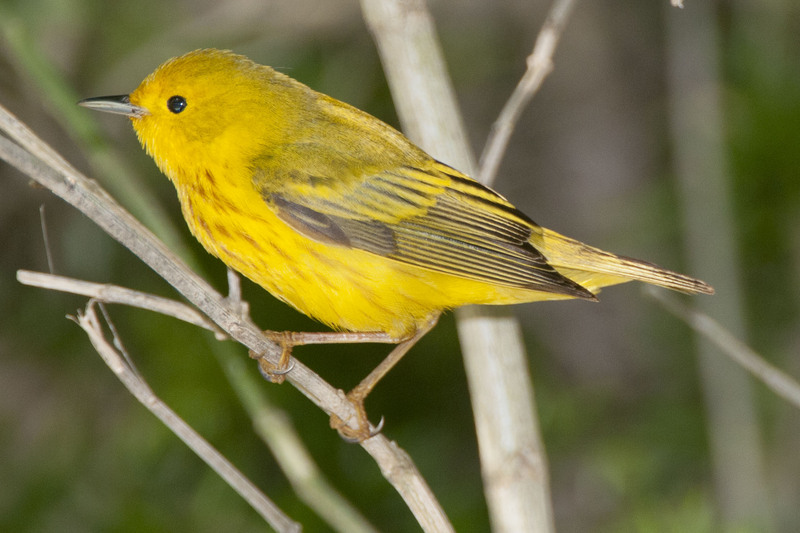 Small, sturdy, all-yellow warbler with olive upperparts; males may have orangey breast streaks; females duller yellow. Actively explores vegetation for exclusively insectivorous diet. Typically nests in fork of small tree; often nest-parasitized by Brown-headed Cowbirds, but may cover up cowbird eggs if discovered. Lifespan up to 11 years. Population ~ 90 million and stable.